Tuolumne (rhymes with “follow me”) County, located 2 ½ hours east of the San Francisco Bay Area, is a pristine, scenic expanse reaching from the foothills into the Sierra Nevada Mountains. Gold was discovered in Tuolumne County in 1848, setting off the major gold rush of 1849. The main highways leading to the picturesque drive from San Francisco and East Bay Area are Highways 108 and 120 from the west and Highway 49 from the north. The CA Highway 120 entrance to Yosemite National Park is considered the “front door” of the park for the San Francisco Bay Area. The Stanislaus National Forest, Yosemite National Park and other surrounding areas provide natural vistas and settings for hiking, water skiing, horseback riding, rafting, camping, snowmobiling, boating, snow skiing, fishing and other outdoor activities. Historic hotels, golf courses, numerous and varied dining establishments, historic saloons, wineries and a hard cider distillery, train rides, casinos, museums, two state historic parks, live theatre and many bed-and-breakfast inns are among the many other attributes that make the county a year-round vacation destination. 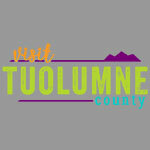 The Tuolumne County Visitors Bureau operates two year-round Visitors Centers, and one seasonal, with friendly, knowledgeable staff who can help you plan your visit.